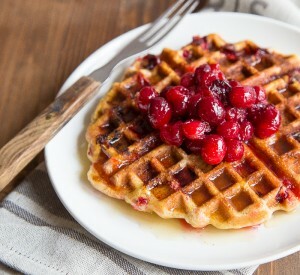 Cranberry cornmeal waffles (a small batch of waffles). The best way to use up leftover cranberry sauce! I’ve been reading cookbooks like novels for years. Since before I realized I wanted to work in the food world. Since before I was on the brink of dropping out of grad school to attend cooking school. (I didn’t. I should have). Before I even moved out of my parents house, my Mom and I would sit on the couch each night after supper and pour through the latest food magazines and cookbooks. It’s always been one of my favorite pastimes. We still do it when I go home to visit. In fact, as you read this, I’m home in Texas for Thanksgiving…most likely reading food magazines on the couch with my mama. I’ve pick up tips and tricks from all of these cookbooks and food magazines along the way, and I store them in my brain vault. I can’t tell you the name of the movie I saw last week, or even remember something you told me yesterday (I’m the best secret keeper ever! ), but I can remember a trick I learned to make extra crispy waffles from Pam Anderson. No, not that Pam Anderson. THIS Pam Anderson. The superior version of Pam Anderson. Pam’s trick is to separate the eggs, whip the whites, and then fold the whites back in at the end. The light, airy nature of egg whites make for airy, crispy waffles. Pam A. knows her waffles. She knows her stuff in the kitchen in general, but her waffle trick really stuck with me. 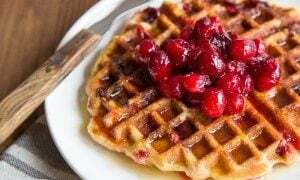 This is a small batch of cranberry cornmeal waffles, so we’re only using one egg. You can surely beat and separate one egg. I believe in you! If not, just whisk the whole egg in, the waffles will still be amazing. Not the absolute crispiest they can be, but amazing. The cider syrup was a bit of an after-thought. I bought a giant jug of fresh apple cider for mixing with Bourbon in the evenings. I haven’t been drinking much since August (thanks to a sugar detox), and it was just sitting in my fridge. When I reduced some down for my apple cider caramels, a light bulb went off in my head. Apple cider syrup is a great substitute for maple syrup, and can we call it sugar-free? Or at least naturally-sweetened? We can! And then, we can file it in the kid-friendly section, since we’re always looking for naturally-sweetened recipes for kids! I’m assuming you might have leftover cider and cranberries from Thanksgiving. You at least have leftover cranberry sauce, don’t you? If not, I provided a recipe for a small batch of cranberry sauce specifically for this recipe. It will dirty a pot, but it’s so quick to throw together. You might even have leftover cider from Thanksgiving, too! 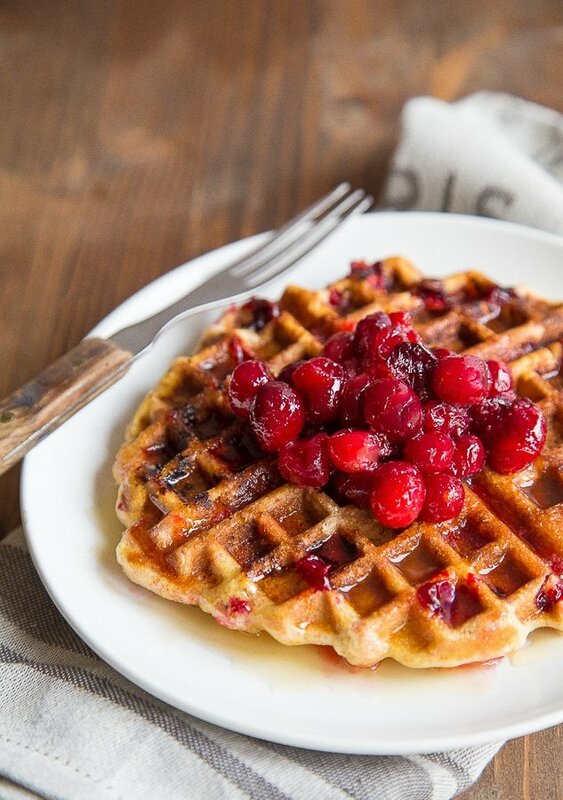 You can put both to use in this recipe for cranberry cornmeal waffles. Enjoy! P.S. Please come back and tell me that you agree with me: apple cider syrup is even better than maple syrup. Scandalous, I know! But true. So true. Preheat your waffle iron to the highest setting. Mine is 5. In a medium bowl, whisk together the cornmeal, flour, cornstarch, salt, baking powder, and baking soda. In a glass measuring cup, whisk together the milk, canola oil, and egg yolk. In a separate small bowl, beat the egg white until soft peaks form. You can do it by hand, or use an electric mixer. Add the sugar, and continue beating until stiff. Pour the wet ingredients into the dry, and stir to combine, but do not over mix. It will be thick. Next, add one-third of the egg whites, and fold them into the waffle batter. Proper folding technique is down the middle with the narrowest part of the spatula, and then sweep the edges of the bowl. Repeat until well-combined. Repeat the process with the remaining egg white in two batches. Next, stir in the cranberry sauce. Place a heaping 1/2 cup of batter on your waffle iron (this is half of the mixture). Close the lid and cook until the light tells you it's done. I use a regular, not Belgian waffle iron. If you're using a Belgian waffle iron, you'll probably have to double the recipe because they hold more batter. Repeat with the last half of the batter to make the second waffle. *If you need to make cranberry sauce: combine all the ingredients in a saucepan and cook on low for 4-5 minutes, until the berries start popping. It's best to stop the cooking process before they turn into a mush; you want mostly whole berries. *To make the apple cider syrup, boil 2 cups of apple cider down to 1/2 cup. It will take 40 minutes or so. Sadly, we have no leftover cider or cranberries but I should buy some just to make these! Separating the eggs and beating the whites is totally my secret to fluffy pancakes and waffles. Yes, for dingle serving ones is a bit of a pain, but is SO worth it; especially pancakes which can sometimes not be fluffy when making a single serving. And I NEED fluffy. And now I want waffles. These waffles are absolute perfection! This looks like a great breakfast! MMMMM I think these are going to be on the menu for our breakfast for dinner night this week! Cider syrup is genius. I can’t wait to try that trick! Thanks for the tip on making crispy waffles. I love a crispy waffle! And I love this recipe! I think I would like these so much more than regular waffles… especially with the addition of cornmeal. Now, where did I put my waffle iron when I cleaned out the kitchen this summer?! Time to dig it back out! Reading cookbooks is one of my favorite things to do. I even re-read my favorites…never gets old! These waffle look amazing, and I’m all about that cider syrup. I’m going to try your suggestion about folding in the egg whites the next time I make pancakes. Thanks for a great post! There’s something about cornmeal that I love! It must be the grittiness! An apple cider syrup sounds just delicious. Brilliant idea! I love the process of cooking it down to a syrup because it makes the house smell so good too. I’ve never made cornmeal waffles before. Think I have been missing out on something seriously delicious though, these look incredible and I am loving the sound of that cider syrup especially! what a great breakfast for the season! These waffles were delicious and had a great crunch to them! I Made them with coconut oil instead of canola oil, and used some raspberry jam in place of the cranberry sauce. I would definitely make these again. If we’re using leftover cranberry sauce, how much should we use?